I, ………. 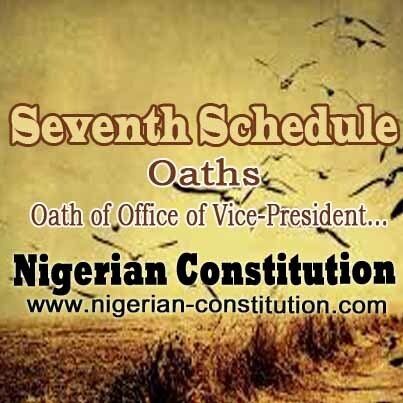 do solemnly swear/affirm that I will be faithful and bear true allegiance to the Federal Republic of Nigeria; that as Vice-President of the Federal Republic of Nigeria/Deputy Governor of ……. State/Minister of the Government of the Federation/Commissioner of the Government …….. State/Special Adviser to …….., I will discharge my duties to the best of my ability, faithfully and in accordance with the Constitution of the Federal Republic of Nigeria and the law, and always in the interest of the sovereignty, integrity, solidarity, well¬being and prosperity of the Federal Republic of Nigeria; that I will strive to preserve the Fundamental Objectives and Directive Principles of State Policy contained in the Constitution of the Federal Republic of Nigeria; that I will not allow my personal interest to influence my official conduct or my official decisions, that I will to the best of my ability preserve, protect and defend the Constitution of the Federal Republic of Nigeria; that I will abide by the Code of Conduct contained in the Fifth Schedule to the Constitution of the Federal Republic of Nigeria; that in all circumstances, I will do right to all manner of people, according to law, without fear or favour, affection or ill-will; that I will not directly or indirectly communicate or reveal to any person any matter which shall be brought under my consideration or shall become known to me as Vice-President of the Federal Republic of Nigeria/Deputy Governor of ….. State/Minister of the Government of the Federation/Commissioner of …… State/Special Adviser to ……… except as may be required for the due discharge of my duties as Vice President/Deputy Governor of ……. State/Minister/Commissioner/Special Adviser.